Giovanni di Paolo's brilliant color and pattern were typically Sienese, but he is distinguished from his teachers and contemporaries by an expressive imagination. His unique style is otherworldly and spiritual. Here the drama is heightened by a dark background and contrasting colors, nervous patterns, and unreal proportions. In the center, Gabriel brings news of Christ's future birth to the Virgin. Thus is put in motion the promise of salvation for humankind, a salvation necessitated by the expulsion of Adam and Eve from Paradise, which we see happening on the left, outside Mary's jewellike home. Mary will reopen the doors of Paradise closed by Eve's sin. The scene of Joseph warming himself in front of a fire, on the right, is an unusual addition. Perhaps it refers simply to the season of Jesus' birth, but more likely it is layered with other meanings, suggesting the flames of hope and charity and invoking the winter of sin now to be replaced by the spring of this new era of Grace. The three scenes help make explicit the connection between the Fall and God's promise of salvation, which is fulfilled at the moment of the Annunication. Though Giovanni's primary concern is not the appearance of the natural world, it is clear that he was aware of contemporary developments in the realistic depiction of space. Note how the floor tiles appear to recede, a technique adopted by Florentine artists experimenting with the new science of perspective. The Annunciation and Expulsion from Paradise, circa 1435, National Gallery of Art, Washington D.C. This extraordinary panel is widely admired for its brilliant colours, curious iconography, and mystical vitality At the left, God the Father, supported by 12 blue cherubim, flies downward, pointing with his right hand at a circular "mappamondo", which fills the lower half of the scene. The representation of earth is surrounded by concentric circles, including a green ring (for water), a blue ring (for air), a red ring (for fire), the circles of the seven planets, and the circle of the Zodiac. On the right, in a separate scene set in a meadow filled with flowers, Adam and Eve walk to the right against a line of seven trees with golden fruit. Their heads turn back toward a naked angel, who expels them from Paradise. Below them spring the four rivers of Paradise, which extend to the base of the picture. This panel is a fragment from the predella of an altarpiece painted for the church of San Domenico in Siena and now in the Uffizi in Florence. Another panel from the same predella is also in the Museum's collection. The influence of the International Gothic style, especially French miniature painting, can be seen in the figures of the angel, Adam, and Eve, and in the details of flora and fauna. The Adoration of the Magi takes place high in the mountains; the figures derive from Gentile da Fabriano's courtly magi, though a more intimate note is struck when the young King reassures the ever-bewildered Joseph, placing an arm around his shoulders and tenderly taking his hand. Behind the green alpine meadow and its calm pastoral air, however, we plunge suddenly down onto a patchwork plain of almost infinite extension - a quilt of palest blue and khaki, merging with the feathery sky, and painted with an atmospheric touch so delicate and limpid that it challenges the work of his great Venetian contemporaries. Giovanni di Paolo's brilliant color and pattern were typically Sienese, but he is distinguished from his teachers and contemporaries by an expressive imagination. His unique style is otherworldly and spiritual. Though Giovanni's primary concern is not the appearance of the natural world, it is clear that he was aware of contemporary developments in the realistic depiction of space. In the mid-1460s Pope Pius II commissioned four of Siena's leading painters to execute altarpieces for his newly completed cathedral in Pienza. These were the two slightly older painters Sano di Pietro and Giovanni di Paolo, the tried and tested Vecchietta, and a younger painter, Matteo di Giovanni. Each of the four painters executed an altarpiece whose form and subject matter appears to have been closely controlled by their humanist patron. The cathedral in Pienza was built by the Florentine architect Bernardo Rossellino according to the patron's taste for both Italian renaissance architecture and the tall, luminous interiors of north European churches, it was furnished entirely according to his preferences and wishes. Together with Sassetta, Giovanni di Paolo was one of the leading Sienese painters in the fifteenth century. So strong was the hold on Sienese art of its great fourteenth-century masters - Duccio and his followers - that both Giovanni di Paolo and Sassetta consistently harked back to earlier models. 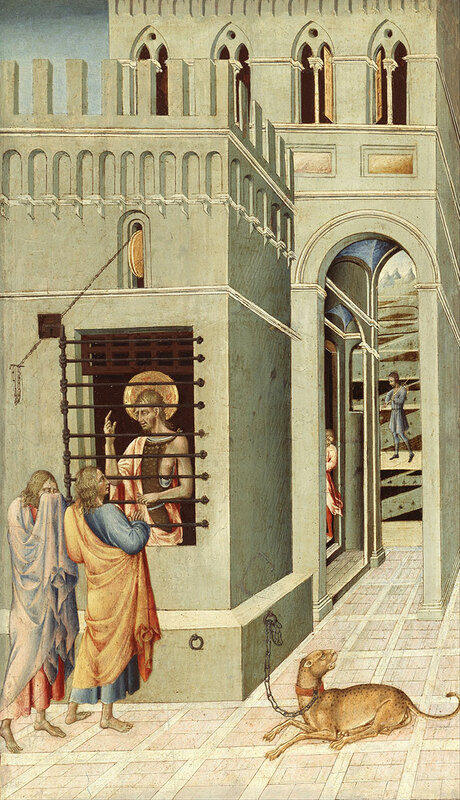 Giovanni's dual allegiance to the modern and the old can clearly be seen in the four predella panels of Scenes from the Life of Saint John the Baptist at the National Gallery in London, of which Saint John retiring to the Desert is likely to have been the second from the left. The other panels represent the saint's birth, the Baptism of Christ, and the Feast of Herod at which Salome's dance and Herod's reward for it brought about the decapitation of the saint. The story of Saint John the Baptist is told in the Gospels and in legend, and its pictorial tradition was well established by the fifteenth century. The altarpiece of which these panels formed the predella - a box-like supporting element for the main painting - was a large Madonna and Saints perhaps painted for the church of Sant'Agostino in Siena (now in the Metropolitan Museum, New York). This scene shows the Baptist as a child, carrying his few needs on his shoulder, leaving the familiar city gate to make his way up into the wilderness. Just to his right we see him again, several miles away, but not reduced at all in scale: a giant walking up the steep mountain path. The head and torso of the two figures are almost identical, but as John climbs he slings his bundle over the other shoulder. Thus the spectator has moved with St John, and the foreground landscape becomes the vista opening up below as the child climbs. The picture is about renouncing the city, leaving behind the man-made grid of cultivated fields, its beautiful patchwork of contrasted greens, for a world of wilder forms. Higher up, we glimpse a yet further region - a blue-and-white ice realm, across a dark river, extending to the curved rim of the horizon - all laid in with a scintillating economy of mark. Charming are the borders of roses painted entirely realistically on either side. Curiously, these are seen from below, as by a viewer at eye level with the lower bud on each branch. Catherine Benincasa was born in Siena in about 1347, died in 1380, and was canonized in 1461. She was a member of the Dominican order, a mystic, and minister to the poor and plague-stricken. A biography of Saint Catherine was written by her confessor, Raymond of Capua. In this scene, Catherine is shown elevated in rapture against a background of several churches. She holds out her heart to Christ, who appears above her, his hand raised in blessing. The panel St Catherine Exchanging her Heart with Christ is from a series of ten scenes from the life of Saint Catherine of Siena. Giovanni di Paolo was already in his mid-sixties when he embarked on ten scenes from the Life of St Catherine, commissioned by the Hospital immediately after the Sienese Pope Pius II had secured her controversial canonization in 1461. Giovanni would have known her story intimately: working at San Domenico as a young man, he must have met many of her surviving friends and followers. Catherine had prayed to Christ to give her a new, pure heart. A few days later, 'elevated in rapture... her heart leapt out of her body, entered Christ's side, and was made one with his heart'. Here, Catherine levitates outside her greenish grey convent with its pink roofs; the operation is under way, as she holds her left hand to her bosom, and stretches forth her right, her scarlet heart spurting blood. 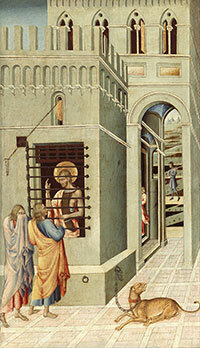 Christ rears up behind his own image as the Man of Sorrows above the open church door. This series is usually associated with an altarpiece commissioned from Giovanni di Paolo by the guild of the Pizzicaiuoli (purveyors of dry goods) in 1447 for the church of the hospital of Santa Maria della Scala in Siena. The central panel of the altarpiece is a "Purification of the Virgin" ["Presentation of Christ in the Temple"] now in the Pinacoteca Nazionale, Siena. 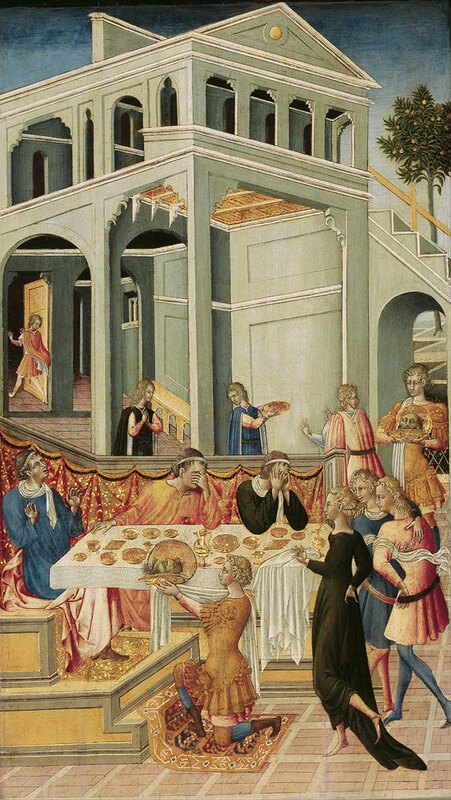 In the first scene, Catherine miraculously receives communion from Christ while her confessor, officiating at another chapel in the church, raises his hand in astonishment at the consecrated wafer, from which a piece has disappeared. In the second, Catherine is mystically united with Christ. Christ's mother presides over the event, and music is provided by the Israelite King David. In the third, Catherine is shown elevated in rapture, holding her heart, which leapt out of her body to be united with Christ's. Giovanni's brilliant color and pattern were typically Sienese, but he is distinguished from his teachers and contemporaries by an expressive imagination. His unique style is otherworldly and spiritual. Here the drama is heightened by a dark background and contrasting colors, nervous patterns, and unreal proportions. In the center, Gabriel brings news of Christ's future birth to the Virgin. Thus is put in motion the promise of salvation for humankind, a salvation necessitated by the expulsion of Adam and Eve from Paradise, which we see happening on the left, outside Mary's jewellike home. Mary will reopen the doors of Paradise closed by Eve's sin. The scene of Joseph warming himself in front of a fire, on the right, is an unusual addition. Perhaps it refers simply to the season of Jesus' birth, but more likely it is layered with other meanings, suggesting the flames of hope and charity and invoking the winter of sin now to be replaced by the spring of this new era of Grace. The three scenes help make explicit the connection between the Fall and God's promise of salvation, which is fulfilled at the moment of the Annunication. Giovanni di Paolo produced not only numerous large altarpieces and small devotional panels, such as The Annunciation and Expulsion from Paradise and The Adoration of the Magi, but also a range of manuscript illumination, including grand choir books and a volume of Dante’s Divine Comedy. The Initial A on view, cut from a gradual, illustrates Psalm 24, a prayer for protection from enemies. David, appearing old and frail, with his hands raised in desperation, now looks for deliverance from the Lord. This solemn event stands in stark contrast to the initial itself: a powerful winged dragon gives the letter form even as the beast devours part of it. This inventive initial in the form of a voracious winged dragon was the first, and probably the largest, in the choir book. Within the letter, King David kneels as the Lord raises his hand in blessing. The initial's subject was inspired by the text of the chant it introduces. The chant is taken from Psalm 24 which includes the lines, "He that hath clean hands and a pure heart; who hath not lifted up his soul onto vanity, nor sworn deceitfully. He shall receive the blessing from the Lord..."
The account books of the most important offices of Siena's medieval municipality had covers made of decorated wooden panels. These were called 'bicherne', named after Bicherna, the financial office that started decorating its manuscripts before any other office did and continued to do so extensively. Production of these decorated book covers started in 1257 and continued until the middle of the fifteenth century. This strange alliance between art and bureaucracy is one of the most original manifestations of Sienese art and involved some of the finest artists. This Annunciation panel comes from the Gabella Generale (general tax office). It shows the Virgin Mary, seated on a chest with her hands joined in prayer and wrapped in a voluminous cloak. The Archangel Gabriel stands before her with his arms crossed and holding an olive branch in one hand, symbolizing peace. In the middle of the painting, between the figures of Mary and the archangel, is a finely worked vase holding a bunch of lilies. They symbolize Mary's purity and virginity. Above the vase, God's blessing hand sends out rays of light that carry the dove of the Holy Spirit toward Mary. Castiglione d'Orcia marks the boundary between Val d'Orcia and the Monte Amiata and was a strategic defence point for the old Via Francigena. Rocca d'Orcia is nearby and worthy of a mention with its impressive fortified tower. Sala d'Arte San Giovanni, (Via San Giovanni 10), housed in the former residence of the religious brotherhood of the same name, holds paintings by some of the major representatives of the Sienese school: Simone Martini, Lorenzo di Pietro known as Il Vecchietta and Giovanni di Paolo. "La Madonna col Bambino di Giovanni di Paolo, eseguita più di un secolo dopo, verso il 1445, rappresenta, per la sofisticata stesura dei colori trasparenti su campiture dorate, la soffice pittura degli incarnati e l’eleganza delle vesti e delle ali degli angeli, una ennesima felice interpretazione della pittura tardogotica del grande Gentile da Fabriano, che tanto affascinò il maestro senese. Guarda invece al Rinascimento la tavola del Vecchietta, pure degli stessi anni; forte dell’esperienza maturata al fianco di Masolino a Castiglione Olona, il maestro senese accorda, con le cromie delicate e i modi cortesi delle figure, una inclinazione per l’arte nuova di Masaccio che appare ben evidente nella fuga prospettica del trono e nella corporatura robusta del Bambino." The city-state of Siena, a large Italian hill town some 70km south of Florence, had its golden age in the early trecentro under the artistic genius of Duccio (c.1260–1319) and Simone Martini (c.1285–1344). They developed a rich courtly style dependent on a dancing line rather than the naturalistic concerns of Florentine painters such as Giotto. 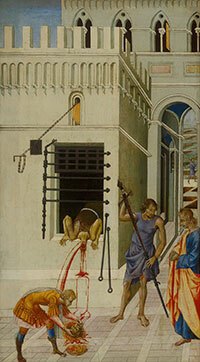 Giovanni di Paolo’s Crucifixion pays homage to this legacy, to which he was bound by a continuous workshop tradition. The stylised scalloping of the figures’ cascading drapery is a hallmark of this regional inheritance. The artist seems to have been enormously popular in his own lifetime and over two hundred generally-accepted autograph works survive. The painting shows the Virgin Mary, Mary Madgalen, a donor and St John the Evangelist below the crucified Christ. Tempera and gold leaf have been applied to a ground of white gesso, onto a support of three poplar planks. Suspended from the cross, Christ’s limp, ashen-coloured body is uncompromising against the gilded background. Giovanni di Paolo has contrasted the silent dignity of the dead Saviour with the intense grief of the terrestrial mourners. The exquisitely painted, almost transparent veil of Christ’s loin-cloth is a dramatic counterpoint to the heavy drapery of the figures below, while His wax-like flesh accentuates the pinks and reds of the other faces. Key witnesses to the Crucifixion, the Virgin Mary and St John are conventionally colour-coded in blue and red respectively, although the blue of Mary’s robe now appears green. The Magdalen is shown with blond hair flowing over her scarlet garment, hands crossed and clutching the cross. Her fingers are shown clutching the edge of the suppedaneum (the block to which Christ’s feet are nailed), while his blood is shown streaming down the cross. 'Catherine Benincasa was born in Siena in about 1347, died in 1380, and was canonized in 1461. She was a member of the Dominican order, a mystic, and minister to the poor and plague-stricken. The term has also been extended to designate painted covers and small panels connected with other Sienese civic offices and institutions, such as the tax office (Gabella), the hospital of S Maria della Scala, the Opera del Duomo and various lay confraternities. Most biccherne, however, are from the office of the Biccherna itself. The first wooden boards are simple and have no intention of being masterpieces. Subsequently, however, the paintings become more elaborate and rich and are commissioned to famous authors as Giovanni di Paolo, Sano di Pietro, Lorenzo di Pietro called il Vecchietta. Museum of the Biccherna Tablets in Siena. In Palazzo Piccolomini, typical style of Florentine Renaissance, this museum holds the ancient tablets of the state ledgers and a collection of ancient manuscripts and books. Illustration of Dante's Paradiso, canto X, first circle of the 12 teachers of wisdom led by Thomas Aquinas Manuscript Manuscript: British Library, Yates Thompson 36, fol. 147 (between 1442 and c.1450). Dante and Beatrice meet twelve wise men in the Sphere of the Sun (miniature by Giovanni di Paolo), Canto 10. Paradiso (Italian for "Paradise" or "Heaven") is the third and final part of Dante's Divine Comedy, following the Inferno and the Purgatorio. It is an allegory telling of Dante's journey through Heaven, guided by Beatrice, who symbolises theology. In the poem, Paradise is depicted as a series of concentric spheres surrounding the earth, consisting of the Moon, Mercury, Venus, the Sun, Mars, Jupiter, Saturn, the Fixed Stars, the Primum Mobile and finally, the Empyrean. It was written in the early 14th century. British Library Catalogue of Illuminated Manuscripts | Dante Alighieri | Divina Commedia, between 1444 and c. 1450 | Inferno and Purgatorio (ff. 1-128), and all historiated initials illuminated by Priamo della Quercia between 1442 and 1450 (previously attributed to Lorenzo Vecchietta; Paradiso (ff. 129-190v) illuminated by Giovanni di Paolo c. 1450. John Wyndham Pope-Hennessy, Paradiso: The Illuminations to Dante's Divine Comedy by Giovanni Di Paolo, New York, Random House, 1993. Dante's Divine Comedy has inspired artists from Giotto down to the present. Perhaps among the most beautiful illustrations are those of the 15th-century Sienese painter Giovanni di Paolo, who illuminated a Paradiso manuscript for the library of the King of Naples, now in the British Library as Yates-Thompson MS 36. Pope-Hennessy, the noted British art historian, presents reproductions of di Paolo's 61 illuminations in a large format and in full color. He includes a lucid historical introduction and a commentary on the content of each of the miniatures. The book also includes Charles Singleton's prose translation of the Paradiso . Podere Santa Pia, an ancient small cloister, faces the gentle hills of Maremma Region, a place always admired for its views and its surrounding landscape. Santa Pia offers its guests a breathtaking view over the Maremma hills. On clear days or evening, one can even see Corsica. This article uses material from the Wikipedia article Giovanni di Paolo. Images: Wikimedia Commons has media related to Giovanni di Paolo.